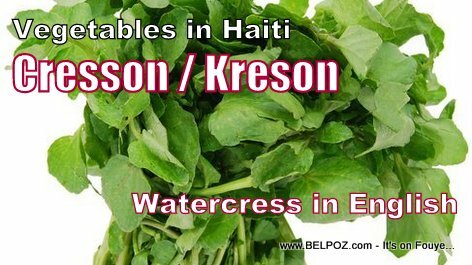 Many Haitians eat "kreson" (watercress) as a salad but did you know that watercress contains more calcium than milk, more vitamin C than oranges, more iron than spinach and more folate than bananas? Watercress is considered to be one of the healthiest food on the planet. The Center for Disease Control conducted a study in which they try to define the most nutritious food found in nature. They analyzed 17 nutrients that are naturally found in foods like vitamins and minerals as well as fiber and proteins. The results were interesting. watercress came in first place beating all cruciferous vegetables, fruits, and greens. Now I eat fresh watercress every day, not just because it is available every day fress from the local marché (marketplace) in my Haiti hometown but because I know of all the benefits packed inside this little leafy green vegetable. Cresson or watercress has more than 15 essential vitamins and minerals. Watercress is considered a super food and for a good reason. « A Haitian Taxi Moto driver earns more $$$ per month than a Haitian Police Officer!